Last week was a busy week for all of us at Dayinsure HQ as we sent our 12 strong team of cyclists on their London to Paris challenge in aid of The Johsua Tree. The Joshua Tree does an amazing job of supporting families affected by childhood cancer. Facing childhood cancer is something nobody ever expects will happen to them or their children and can have a devastating effect on the children and families for many years after the treatment ends. The Joshua Tree are experts at providing tailored support which fits with every family’s unique circumstances to help them through this challenging time. The #digdeep project will allow The Joshua Tree to build a new Support Centre in Sandiway for families and children of all ages in order to improve their support activities. The new build will feature a multi-functional activity room, private counselling and therapy suites, and an extensive outdoor play area. The day started bright and early on Thursday mounting their bikes from the centre of Greenwich and getting onto the road, with the team starting incredibly strongly ploughing and weaving their way through busy London, the team were on a tight timescale to get to Newhaven for 16:00 to catch the ferry to Dieppe so time was of the essence. Once they broke through the smog of London the speed started to increase even with the challenging hills and 65 miles the cyclists made it to Newhaven just in time with everyone in fairly good spirits although very tired and sore as this was the first time many of the riders had ridden over 50 miles. Starting the day after being well refuelled and destroying the hotel breakfast buffet, the riders were up and ready to rumble for day two. This was meant to be one of the fastest sections of the route as 35 miles of the route ran along an abandoned railway cycle path. After practising creating a train to maximise the slipstream created by the person in front of us, this was meant to be our moment to shine. After one minor crash, we eventually cracked it and managed to average 17 mph and had done 35 miles by lunch. After stopping for our nutritionist planned meal of cake, coffee and coke we were back on the road although, this time the saddle had definitely become noticeable for a few of the members of the team. Now we had a few nasty hills ahead of us so it was a mental game to power through and make it to our next stop. Finally, we made it finishing at 18:00 we loaded the bikes into the van and waited for our lift to the hotel, this unexpectedly this took 2 hours longer than expected so team bonding took a whole new level as we huddled around the local church’s high powered lights for warmth. After a much-needed rest, it was the final day and the last leg into Paris, Although we were all slightly tentative as this route had some of the biggest climbs we had faced and after two days of fatigue and a few injuries we set off for the long slog to the city of love. After lunch, everyone had finally realised that it was actually going to finish and were on a high when we started to see the signs for Paris. We stopped briefly for a break by the river and to raise some extra money, one of our members decided he would go for a swim in the river if we all donated another £10, which, obviously we all agreed to. After a couple more serious hills which tried to dampen our spirits, it was worth it as we reached the final summit and the city came alive in the distance and finally we could see the Eiffel Tower. We rode down through the traffic, parks and the hustle & bustle and finally hitting the Pont d’Iena bridge the emotions hit everyone and as a team, we had made it. 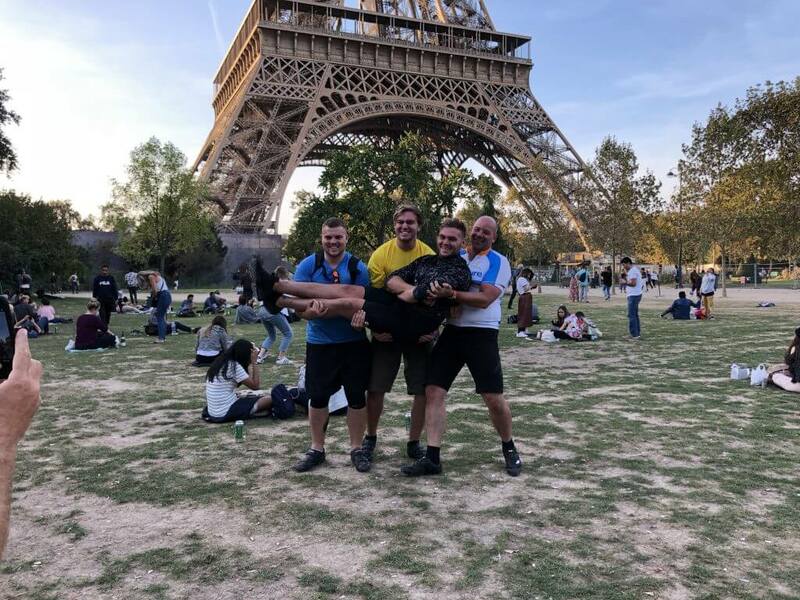 Amazingly, after only one punctured tyre, a small number of falls and an abundance of cake stops which could have fed a small army, the team finally made it to the Eiffel Tower on Saturday evening and the celebrations began. For the whole team, it was a massive achievement as most had only taken up cycling a few months prior to the event. One of our cyclists even completed the 188 miles in 3-day challenge at 60 years of age! For the team to all cross the finish line together nothing felt better and we have to say the celebrations lasted long into the early hours of the morning and nearly included a sacrificial execution of the bikes. We’re so pleased to say that the team safely completed the 188-mile cycle challenge and we couldn’t be happier! So far they have raised an amazing £7,910 for The Joshua Tree which will make a huge difference so we’re incredibly proud of all their hard work and to have the chance to raise the money for the charity is an honour to be able to help the children affected we would all push ourselves again to see it go to such a great cause. If you want to show your support to the team? It’s not too late to and you can donate to The Joshua Tree, any donations would be greatly appreciated in aid of such a fantastic cause. Check out our behind the scenes video of the 3-day ride!